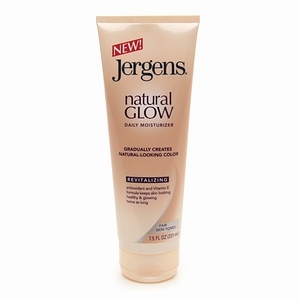 I am currently using Jergens Natural Glow Revitalizing Fair to Medium. This is an amazing self tanning lotion that you would use like a daily moisturizer. Right after I showered, I applied all over my body. I left the lotion dry before dressing. And it seems like 10 minutes later, I can see a subtle difference in my skin color. 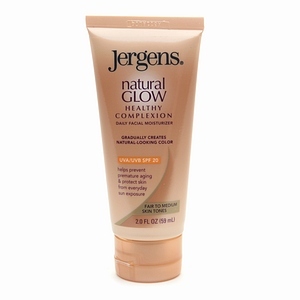 I also use the Jergens Natural Glow Healthy Complexion Daily Facial Moisturizer. This helps my face match up with my body tanning color. I didn’t want to be tanned yet my face is still pale. Also within minutes I could see the difference from before and after. I went the entire day feeling great about myself. I have a decent looking tan with no streaking and no mess. It cost me probably under $15 for both products. I do enjoy going out and getting a natural tan but I lack time. I do not get to enjoy the outdoors much and probably won’t be able to do so any time soon. Something did happened the very next day, that discouraged me from this product. I started to develop a rash. My skin is sensitive to this tanning lotion. The weird thing was the rash only covered my torso – back and front. I thought about it and figured I applied too much on my torso. I waited 4 days later to reapply a 2nd time. This time I skipped my torso. By the 4th day of no tanning application, I did not that the tan was disappearing. It did leave a slight stain on my knees and elbows. After the 2nd time I used it, I notice a sensitivity around my collar area, the back of my thighs and calves. Forearms had some irritation but was not bad. If I didn’t give in to the itchiness, the rash would subside. So even though I want a tan, the rash is making me scared to continue this product. I am hoping that I can slowly build a resistance to the rash with just minimal bi-weekly applications.